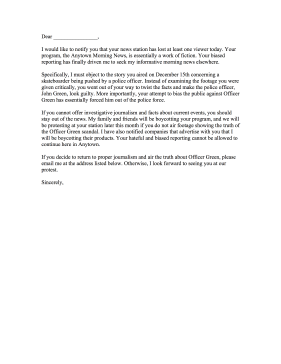 Bad or inaccurate reporting can be protested with this viewer complaint letter against a news station. I would like to notify you that your news station has lost at least one viewer today. Your program, the Anytown Morning News, is essentially a work of fiction. Your biased reporting has finally driven me to seek my informative morning news elsewhere. Specifically, I must object to the story you aired on December 15th concerning a skateboarder being pushed by a police officer. Instead of examining the footage you were given critically, you went out of your way to twist the facts and make the police officer, John Green, look guilty. More importantly, your attempt to bias the public against Officer Green has essentially forced him out of the police force. If you cannot offer investigative journalism and facts about current events, you should stay out of the news. My family and friends will be boycotting your program, and we will be protesting at your station later this month if you do not air footage showing the truth of the Officer Green scandal. I have also notified companies that advertise with you that I will be boycotting their products. Your hateful and biased reporting cannot be allowed to continue here in Anytown. If you decide to return to proper journalism and air the truth about Officer Green, please email me at the address listed below. Otherwise, I look forward to seeing you at our protest.